Planning an eco-friendly barn involves alternative lighting and heating systems, sustainable and renewable materials, and much more. Going green benefits people, your animals, the environment, and your bottom line! Read about these environmentally friendly options to consider when you’re building a new barn. Health, safety, using renewable materials, reducing harm to the environment, plus saving energy and money make eco-friendly buildings appealing for a multitude of reasons! To find out information on tax credits, check out the U.S. government’s Energy Star website. Sustainable building materials include glass wood, recycled-content, roofs with reflective finishes, translucent panels, and low VOC paints, sealants, and stains. Glass wood, used for horse stalls and fencing, combines wood and glass but looks and feels like wood and can be stained or painted. It permanently protects the decay of your barn. Timber is gaining popularity as a building material because it’s aesthetically appealing as well as environmentally friendly. Timber-frame construction is an ideal eco-friendly option because it’s a renewable and easily accessible material. Wood is durable and energy efficient. Wood studs don’t transfer heat and cold as much as metal studs, which creates a more energy-efficient barn. Insulated panels are installed on the outside of barns, eliminating the need for dry wall. The outside panels also provide better insulation. Rainwater collection or harvesting systems collect and store storm water runoff to reuse. These systems allow you to use the collected water for irrigation, composting, watering arenas and more, recycling a natural resource and saving money. Plus, they decrease runoff to help reduce mud around your barn. Energy-efficient lighting like LEDs provides an eco-friendly alternative to harsh fluorescent lights. LEDs last longer and are moisture- and cold-resistant. Look at your state’s energy plan and call local power companies for information on rebates and tax cuts. Be sure to have a licensed electrician install new lighting. The substantial money you’ll save on your electric bills is well worth it! Tubular daylighting devices (TDDs) are rooftop domes that redirect sunlight through tubes into the barn, providing more natural light, which is appealing to humans and animals. Solar panels are one of the biggest energy tax credits available to businesses and homeowners in 2018. They’re an excellent alternative to traditional energy, provide an incredible return on investment, they’re much better for the environment, and very simple to install. Solar hot water systems significantly reduce energy usage. A solar system (vs. an electric one) reduces carbon dioxide. You may receive a tax credit. Look at the U.S. Department of Energy’s Modified Accelerated Cost-Recovery System (MACRS) for incentives. Efficient ventilation provides a healthy space for people and animals and allows fresh air to circulate, creating a just-right temperature while helping to prevent respiratory illnesses. Dutch doors make a simple and attractive way to ventilate your barn. Opening the top half of the door keeps horses safe while allowing fresh air to circulate and letting in natural light. Bonus: they keep dirt at bay when the bottom half is closed. Vertical vents in your barn efficiently circulate fresh air. Vented skylights and eaves plus steep roof slopes all contribute to optimal circulation. Ceiling fans create a comfortable environment for you and your equine friends by continually circulating air. They function well in all seasons, cooling your barn in the warm months and helping to equalize temperatures during the winter. Also consider solar powered fans. They eliminate the use of electrical wiring, reducing the risk of fires. These fans get more years out of your barn roof because they stop ice damming and discourage mold and moisture. Quarry View Construction would love to talk to you about building an eco-friendly barn or making eco-friendly changes to your existing structure. 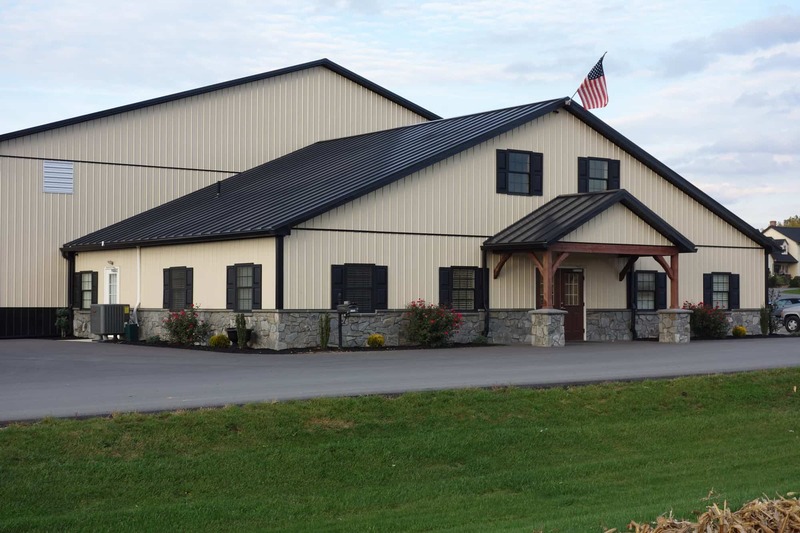 Contact us today to find out how we can help you create a customized energy-efficient, environmentally friendly barn!